1.1 How do I register my colours in France? To become an owner in France, you need to be registered at France Galop and ask for the agreement of France Galop Stewards. You may also request the necessary forms from Anne Delhom by e-mail: news@frbc.net or download it here. Fill in and return the forms so that the stewards can examine the file. A payment of €1,558.60 must be made by bank transfer in Euros. This amount comprises €170.40 administration fee, € 88.20 to register the colours, and a deposit of € 1,300 which will be returned to you if your application is unsuccessful. It is also at this time that you must choose your colours. Upon acceptance of your application, you will receive your owner’s card which admits you onto any racecourse (reserved areas). France Galop will open an owner’s account through which you can execute all of your racing and breeding operations in France. N.B. The amounts indicated above only concern non-residents in France. 1.2 Where can I find French race dates? You can consult our Diary section or alternatively visit the website of France Galop and go to the Racing section. 1.3 How can I purchase badges for races? You can purchase entries online by follow this link: https://www.billetterie.france-galop.com/uk or purchase them directly at the racecourse. 1.4 I would like my horse to run and be trained in France. Who should I contact to find a trainer? You can ask the FRBC for any specific contact details of trainers. If you would like to receive the French trainers’ directory, please contact Anne Delhom: news@frbc.net. You should contact the French Trainers’ Associations which will provide you with a list of trainers. You can also find French trainers statistics on France Galop website. 1.5 I need to find information on racecourses in France? Where do I find this? Go to the racing section of our website and click on RACECOURSES or you can visit the France Galop website and click on RACECOURSES. This service will provide you with a number of options. 1.6 My horse is not trained in France. How can I enter my horse in a French race? France Galop has given notice that, as from January 1st 2012, any entries and declarations for races in France must be made only through its website. Foreign trainers must apply for a personal log-in and password to access the France Galop website. Log-in and password are restricted to licensed trainers and will be delivered after payment of an annual fee. The access is to be renewed at the beginning of each calendar year. From January 1st 2017, there is a charge of €20 per horse registered with France Galop. or contact: Laurent Payen from the Control Department: lpayen@france-galop.com or by phone +33 1 49 10 21 35 for any questions regarding access details. Entries must be made on the France Galop website through the trainer’s access by 10.30 a.m. (French time) at the closing day and time of the entry stated in the race conditions. Together with the entry, trainers must provide a complete race record of the horse(s) entered in a race in France, which should be sent to the following address: fgperf@france-galop.com. The entry will not be valid if it is not sent by the time of the entry closing or on the eve of the declaration stage (if entries were made more than a month before the race). 1.7 Who publishes the racehorse ratings and where can I find a copy? France Galop publishes annually the ratings for all horses that have raced in France. You can also find up-to-date ratings in their database. The French Breeders’ Association (Syndicat des Eleveurs) publishes a yearly study (L’Etude des Etalons) of the handicap rating of a stallion’s produce; this is published at the end of January and is a very useful stallion guide. 1.8 I would like my horse to run in France this year. My horse is trained outside France. Who should I contact? If your horse is to stay and compete in several races in France, and continue to be trained by his usual trainer, a request must be made to the Stewards of France Galop (Contact Mrs Armelle Nadeau-Russell). To stay more than eight (8) days in France, your horse must be in the care of the trainer or a person who has a licence to train in France and who has a mandate from you, the owner. The place where the horse is stabled and the name of the person who will take care of the horse must be provided to France Galop as soon as they arrive in France. After one month the horse must be re-exported or placed, for your account, permanently with an active trainer in France. In exceptional circumstances the Stewards of France Galop can authorise a horse to stay more than one month provided that the training is carried out personally by his trainer. This must be requested directly. To find out how to enter a horse in France consult the question: My horse is not trained in France. How can I enter my horse in a French race? Contact Mrs Armelle Nadeau-Russell by fax on +33 1 49 10 21 46 anrussell@france-galop.com. 1.9 My horse is entered to race in France and I need to find a jockey. Who do I need to contact? You should make contact with the Jockey’s Association who will provide you with a list of licensed jockeys in France. 1.10 How do I find a trainer in France? It depends on which criteria are important for you. If you only need trainer details, we will be happy to assist you. Some trainers are introduced on our website. More details here. 1.11 What is the procedure for claiming a horse? How can I receive the claim form? How do I find the minimum claiming price? How do I organise the payment? What are the conditions concerning transport after the horse has been claimed? A horse can be claimed after having run in a minimum-priced claimer or a mixed-price claimer (a claiming race where some or all of the runners are available to be claimed at pre-determined sums). These sums are printed in the race card and the newspaper. Those wishing to buy must make an offer through the claiming form; this offer must be at least equal to the indicated claim price. The horse is awarded to the person who made the highest offer. In the case of a tie, there will be a “lottery”. Only the claim forms provided by the organisers may be used. They are available throughout the day (in the weighing room) and these forms are only valid for this day. The elements required on the claim form are: name and signature of the person making the claim, name of the buyer (if it is not the person making the claim), name of the horse and sum offered. The claim forms must be placed in the appropriate box before the time fixed for its collection (normally 15 minutes after the race). The payment must be made in Euros and is payable to France Galop either by cheque or by bank transfer. If you cannot make a payment in Euros you may charge someone to do this for you, either a trainer or a bloodstock agent. The claimed horse is then delivered directly to the buyer accompanied by its passport. 1.12 What is the ifce and what is its task? The L’institut français du cheval et de l’équitation (ifce) has been created by the act n°2010-90 of January 22, 2010 and is placed under the order of both the ministries of agriculture and sports. It assists the equine industry on national and international stage in order to support its development. The ifce is the consultation authority of the equine industry players in order to identify and foresee trends in this sector and its environment. a selection of equids: (certification of origins, inscription in stud books, registration of performances). The information kept in the database of the institute allow to support measures in case of epidemics in alliance with the sanitary services. They contribute to the optimisation of the sanitary control of equids. 1.12 What is the “carte d’immatriculation”? 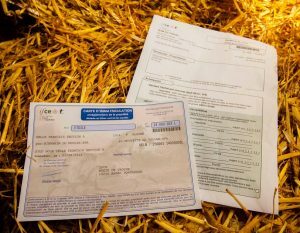 The carte d’immatriculation is the main document indicating the owner of an equid registered in the SIRE database (by ifce). Every equid (horse, poney or donkey) has to have an up-to-date carte d’immatriculation: the updating of one’s horses’ card is compulsory. You can choose between a paper form or electronic form for your card. The carte d’immatriculation is a guarantee and authentication of the registered owner in the SIRE database which secures the transactions. This document allows to know and contact easily the owner. It is a presumption of ownership in case of litigation: a judge refers among other things to that document in order to identify the owner of the equid. Despite the legal aspect, the card connects the owner with his horse also in an emotional way. In case, the owner is living outside of France, the card will be kept at the ifce. The carte d’immatriculation is therefore a connection between the owner and the horse and simplifies many operations. In case you lost the carte d’immatriculation of an equid or it has been stolen, you can ask for a duplicate. 2.1 Where can I find information on French-based stallions? The French based stallions are listed on the French Thoroughbred Breeders’ Association on the following link French TBA – Stallions. 2.2 Can I register my foal in the French stud book? 2.3 I would like to set myself up as a breeder in France. Who should I contact to find a stud farm? We can help you with your search or if you prefer, we will put you in contact with the relevant professionals. Describe the kind of farm you are looking for and send us the details. 2.4 I am looking for a pedigree. Where will I find this information? If your search concerns a stallion based in France the site of the French Breeders’ Association will cover your needs. 2.5 I am a breeder and I would like to visit some studs in France. Can you help me? We can put you in contact with any number of studs and are more than willing to help you with your itinerary. 2.6 How can I purchase a stallion book? The Stallion Book is edited and printed by the French Thoroughbred Breeders’ Association and they can be contacted at info@federationdeseleveursdugalop.fr or visit their website below. 2.7 How and with which association do I register my mare in France? How do I receive the necessary forms? • a cheque corresponding to the cost of registration There is no form to fill out prior to this step. If the mare does not comply to the cases mentioned above then she may not be registered in the French stud book. 3.1 How do I find a bloodstock agent? 3.2 How can I receive the next sales' catalogue? 3.3 I would like to buy a yearling. Who do I need to contact? You can consult the Sales section of our website where you will be able to visit the websites of the sales companies for the sales calendar and bloodstock agents list. You can also find here, all the information on the coming sales in France. 3.4 Where can I find information on hotels and transport in Paris and around France? You can consult our section “Getting to France” or contact us directly and we will organise you a tailor-made tour. Either proceed to the section “Contact us” or send us a message on news@frbc.net. 4.1 I am looking for a company to insure my horse. Can you put me in contact with the right people? 4.2 Who runs flat and jump racing in France? Flat and Jump racing is governed by France Galop, which comes under the authority of the French ministries of Agriculture, Finance and Interior. Its main roles are to encourage the improvement of the racehorse, promote training and to determine prize monies and premiums, and to ensure the correct functioning of French race track betting services. France Galop therefore organises racing, makes available training facilities, writes the rules of racing and ensures their correct application. It also establishes the racing programmes and their calendar. It provides the requisite authorisation needed to race, train or ride a racehorse. France Galop manages 6 racecourses (between Paris and Deauville) as well as three training centres (Chantilly, Maisons-Laffitte and Deauville). 4.3 I am looking for a job in the racing industry. Who should I contact? As a first step, we would recommend you to connect on www.equiressources.com which is a very up-to-date job and internship portal related to the horse industry. It should help you find what’s available on the market.